In the recently celebrated “Black History Month” many inventors, athletes, politicians, activists and educators were commemorated. However, mention of the importance of chess in Black history is too rare. Chess-playing is an amusement worthy of cultivation, especially for the young. It is better in-door entertainment than cards, or dice, or lager-bier; it has been well said that it does not lead to gambling. In looking at Morphy and Paulsen, in 1857, we were struck with the evident purity of both these young men. Neither presented the bleared eyes, shaking hands, nor nervous tremor, which a four-hours sitting would betray in nine-tenths of our young men of the city; they were plainly in perfect physical condition, and all their faculties were clear and in full honest exercise. And so must the devotees of chess keep themselves, or they will inevitably lose rank as chess-players. Succeeding McCune Smith was a Maryland native Theophilus Thompson who was an accomplished problemist and correspondence player. Born in 1855 and working as a domestic servant, Thompson was exceptionally talented. After his chess talent was discovered he was invited to various tournaments, but is perhaps known more for his book, Chess Problems: Either to Play or Mate. Other Black players around the world would take up the game, but Rogelio Ortega of Cuba had the honor of competing against the world in top-flight competition such as including Tal, Spassky, Smyslov, Geller, Portisch, Reshevsky, Najdorf, Rossolimo, Bronstein, and Horowitz. The 1966 Cuban champion had earlier made an impression in the 1959 U.S. Open in Omaha, Nebraska and scored 8½-2½. A particularly sparkling example of Ortega's play follows. A young star was born at the same 1959 U.S. Open. Walter Harris, scored 7-5. He also participated in the 1959 U.S. Junior Open and became the first Black to earn the rank of National Master. Bobby Fischer said that Harris "has some talent." Today Harris, a New York native, resides in Virginia. In a 2005 interview he fondly recalled Bobby Fischer's compliment. Harris states that Fischer was often misunderstood as a rising star on the U.S. chess scene. In the interview, he relayed an incident in which he was not allowed to get a room at a hotel because of the racial segregation law of the time. Harris could not remember if this incident occurred at the same hotel where the tournament was being held (Sheraton-Fontenelle Hotel), but in those days, Blacks were not allowed access to public facilities. The managers had pulled Anthony Saidy (now an IM) aside and told him that Harris was not welcome. Saidy, who was accompanying Harris protested, but the hotel managers were adamant. They went to another hotel where they were able to find accommodations. Harris' studies at UCLA began to command more of his time as he embarked on a career in physics. It was on the west coast that he would meet another legend in Frank Street. Street won the 1965 U.S. Amateur Championship, graced the cover of Chess Life and became the 2nd Black to earn his National Master's title. He later migrated to the west coast where he had contact with Harris. Street was an understudy of Ken Clayton,who would also enter into masterdom in 1967 and became the 1963 US Amateur Champ. Charles Covington, a multi-talented musician and expert checker player, would also make his mark in the 70s. Covington is more-recently known for his self-published history of black chess players. The 1970s introduced the “Fischer Boom” in which many players became enamored with chess through skillful marketing and the iconography of Bobby Fischer. This boomed resulted in tremendous growth in American chess and the Black communities saw a spurt in major cities such as New York, DC/Maryland, Philadelphia, Chicago and Cleveland. Chicago's Morris Giles was a solid master in the early 70s before going on a hiatus and returning ten years later to terrorize his opposition. The unassuming player had the heart of a lion and is famous for his dashing win over Walter Browne. Starting in the late 70s, a young player from the Midwest had begun to terrorize higher-rated opponents with his tactical wizardry. With his charisma and keen mind Emory Tate would raise the standard and serve as an inspiration for other Black players. He has since become an International Master and will go down in history as a legendary figure in American chess. The 1980s demonstrated the effect of the Fischer Boom as a surge of Blacks reached Master level, most hailing from the east coast. Cities such as New York had already established the “Black Bear School of Chess” whose intent was to produce a contingent of Masters. 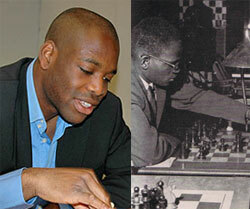 This club would later produce masters such as and the first African-American Grandmaster, Maurice Ashley. Ashley has inspired millions of players including those as far away as Sweden's Pontus Carlsson. Pontus knew that gaining the GM title was only a matter of time, and he confidently spoke of joining Ashley in the Grandmaster ranks. Carlsson recently earned his 3rd and final Grandmaster norm at an international tournament in Mallorca, Spain. Here is his win in Mallorca against Luis Galego. While no Black woman in America has earned Master rank, Baraka Shabazz was an immediate sensation in the early 1980s and would be seen at the famous Dupont Circle in Washington, DC taking on all comers. She participated in the U.S. Women’s Championship at age 15 and represented the U.S. in the under-16 World Championships in England. memorial tournament named after Wilbert Paige, a Philadelphia chess icon. This tournament was played in Harlem, New York and featured 10 of the strongest Black players from the US, Canada, South Africa, Uganda and Zambia. There are many talents ready to step up and become the future of Black chess in America. Sixteen-year old Kayin Barclay has participated in two Denker tournaments and defeated his first Grandmaster, Jaan Ehvlest at the Eastern Open. Ehlvest blundered at the end, and Kayin calmly punished him. Jacob Wamala is #28 among 16-year olds and Michigan’s Jimmy Canty IIIis breaking barriers at #10 among 14-year olds while Tapiwa Gwaze of Texas is rising at #21. Amongst the girls, there is: Medina Parilla, 7th amongst 16-year old girls; Jessica Wamala (2005&2006 Polgar participant); Stephanie Ballom, former state champion of Texas; Darrian Robinson, 2006 World Youth representative; Brianna Conley, 2005 Polgar participant. Black history is important for a number of basic reasons. First, it is rich part of chess history that has been overlooked for decades. Second, it reinforces the notion that chess has universal appeal. Third, it may inspire those who would not normally take an interest in chess. I launched The Chess Drum in 2001 after a series of historic events in Black chess (including Maurice Ashley's GM title in 1999).Since that time the site has grown to almost 6,000 pages and has taken on a life and purpose far greater than its creator. During my six years editing the chess drum, it amazes me how many inspiring stories go untold and how many exciting games never see the light of day. While the attention is primarily on the game’s top players, much can be learned from lesser known players. Every game played, every tournament won, every title earned is important in telling the rise of Blacks in chess- a story of honor and accomplishment… events fit to be celebrated. Lorrea-Ortega- 1...Nxd4 2.Qxd4 Qa7! and Black is crushing. White played 3.Nd3, but after 3…Bxd3 4.Qxd3, Black plays 4…Bxc5+ and all of a sudden mate is unavoidable! The black queen will simply slide to h7 and inflict tremendous pain on the white monarch on h3. An absolutely amazing mating pattern! Be sure to check out the April Chess Life Magazine's profile of Daaim Shabazz by writer and USCF expert Gregory Kearse.